Either you [must go] or I must go. The words ‘must go’ are omitted and said to be understood or implied. I. The omission is essential to the construction but not to the sense of the sentence. as [they would have stuck] to clay. II. 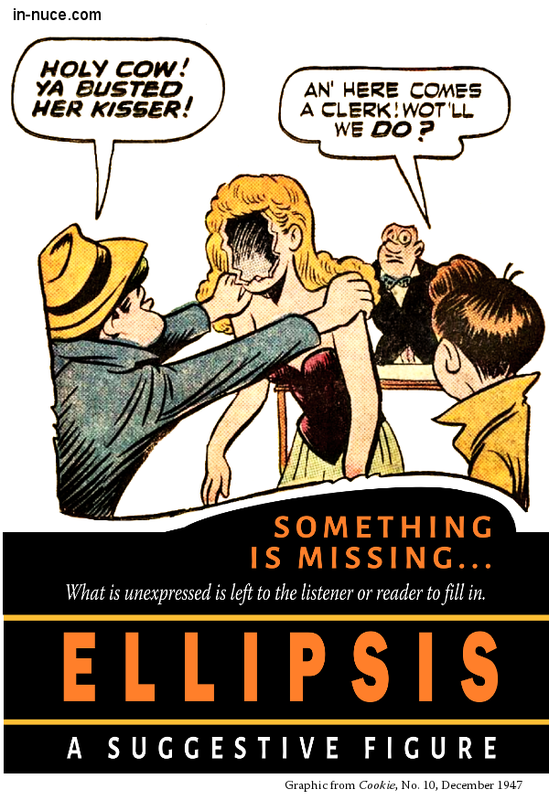 Ellipsis is a suggestive figure. What is unexpressed is left to the listener or reader to intuit. The single word ‘Impossible!’ is more expressive than a complete sentence affirming impossibility. III. There are three types of omission. This is the letter [which] I wrote. He came, [and] saw, [and] conquered. IV. When omitting words from a direct quote, an ellipsis is indicated by three periods. When one, for the sake of brevity or otherwise, omits a word, a group of words, or one or more sentences from a quotation, such omission is indicated by three periods. 1. If words are omitted from the end of a sentence, the end-mark of the sentence, if an exclamation point or an interrogation-point, is retained, and follows the three periods. 2. If the end-mark of the sentence is a period, and one or more sentences following are omitted, there will be four periods at this point. There will be the same number if words are omitted from the beginning of a sentence following a sentence ending with a period.